Formnext is an exhibition and conference for the world of additive manufacturing. 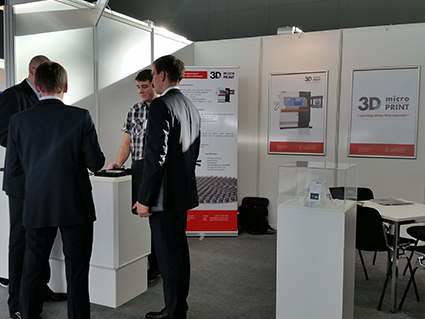 The attendance of 3D MicroPrint with a first own booth was very successful. With more than 21,000 visitors from Germany, Eastern Europe and also Asia, the amount of visitors increased by 60 % compared to previous year. This was also noticeable by the numerous visitors on the 3D MicroPrint booth the whole week. Four co-workers had many interesting conversations about the micro laser sintering technology itself, the fusion of additive manufacturing and micro machining as well as corresponding new opportunities. Finally, 3D MicroPrint is very satisfied with the response at the formnext exhibition 2017.